Money saving apps have become more popular in recent years. It makes sense when you consider that everyone is connected to their smartphones daily and the cost of living continues to rise in every area from housing to transportation to food. To take advantage of my connectivity and lower my out-of-pocket costs for food and other household items, I use an app called Ibotta. Ibotta is a free app that pays you cash back on purchases you make at the grocery store and many other retailers. If you do the grocery shopping for your family, you’ve certainly noticed what the USDA reports – that prices across many food-related categories continues to increase, putting more of a pinch on your budget. Saving money on groceries is a common goal for many but it’s not always easy. While you can often lower costs through meal planning, you may want to find other ways to save at the store. This is where apps like Ibotta can be of great help – especially since they offer $10 just for trying the app! You pay for the items you need upfront but apps like Ibotta let you earn rebates on certain products, putting money right back in your pocket. You can use it to earn cash back on groceries, apparel, cosmetics, mobile apps, and more. With any tool promising cash back, you have to be careful not to spend more money just to earn the reward. So how does this money saving app actually work and is it worth it? I’m sharing my thoughts in this Ibotta review. Ibotta provides offers on a wide variety of items for different brands. If you are gearing up to make a shopping trip, it’s best to hop on the app and see if anything you’re looking for has a rebate offer. The app pulls up offers based on your current area and sometimes they even share the store where you can purchase the item. For example, if I have honey and cat food on my shopping list, I can go to Sam’s Club and earn $6.50 cash back when I purchase the two items shown below. Now, you may be thinking the app will only show name-brand or more expensive products, but rebates are also offered for store and generic brands, too. That’s a big plus! Once you see an offer you like, click on the offer to unlock it. This usually requires you to watch a short 15-second video ad. Once the offers you want are unlocked, it’s time to go shopping! If you’re in the store and see more Ibotta offers on the app for products you can use, just add them to your account. Purchase the items as you normally would and save your receipt. You’ll need that for later to claim your earnings. After you check out at the store, it’s time to redeem your offers and earn cash back. Take a picture of your receipt and scanning barcodes then upload it to the app. Within 48 hours Ibotta will deposit the cash back into your account. The great thing about using this app is that you only get paid in cash and not with points or rewards like so many other money-saving apps. You don’t just have to use Ibotta when making in-store purchases. You can use the app to earn cash back when shopping online, too. There is a list of mobile shopping retailers that the app supports on their website. You can find online offers for travel, clothing, entertainment, and more. Just use the Ibotta portal so your cash back is credited properly. For example, if you’re booking a hotel online and you notice Ibotta offers four percent cash back for using Hotels.com, open the offer and tap “Shop.” Then, you’ll be redirected to the site. When it comes to your cash back earnings, your account balance needs to reach a minimum of $20 before you receive payment. Then the app transfers the cash to your PayPal or Venmo account or you can opt to receive your rewards as a discount. where can you use Ibotta? You can also use Ibotta on a number of online stores so there’s plenty of opportunity to earn money back on a variety of shopping needs. How Much Time Does It Take to earn cash back? When you use money saving apps like Ibotta, you always want weigh your time spent vs. the reward you get. Clipping coupons can help you save money but it’s often time-consuming and offers very little reward. With Ibotta, the rebates you earn won’t make you rich. Luckily the app is very easy to use and doesn’t require much time. It only takes minutes to unlock multiple rebates. Then the time you spend shopping in the store isn’t really affected by using the app. The app saves you time by researching offers in your local area and telling you which stores they’re at. Uploading the receipt is not much of a hassle due to how user-friendly the app is which also cuts your usage time down to just minutes. Some money savings apps offer reward codes to increase earnings or savings. That is not the case with Ibotta. There are no special Ibotta rewards codes, but they do offer a bonus of $10 when you sign up and claim your first cash back offer. Ibotta offers bonuses as well. Just select “Account” then “Bonuses” to find current bonuses. The bonuses vary, but typically offer a certain amount of cash back for spending a certain amount on a specific product or category. Pro: Ibotta makes it easy to earn cash back on everyday shopping beyond just groceries and food. There are even rebates for generic and store brands. Con: There’s a $20 account minimum in order to receive your cash back. Pro: Users receive payments in cash and not points or rewards. Con: There is a temptation to overspend or buy things you don’t really need just to get a rebate. Pro: There are rebates for online shopping including travel, restaurants, and entertainment. If you do any type of couponing or deal shopping, Ibotta is a must. It’s a free app that does most of the legwork for you and pays you cash back for your purchases. Don’t forget they offer $10 just for signing up to use the app! You also don’t have to make a huge time commitment or perform any research in order to start getting rebates. The only downside is that the app does promote spending money to make money. This is why shopping trips shouldn’t be created based on Ibotta rebate offers. It’s best to use Ibotta to compliment a shopping trip you’ve already planned. This earns you earn cash back on the items you truly need and planned to purchase anyway. How do you save money on groceries and other shopping needs? How much do you budget for groceries each month? Do you think Ibotta could help you save money when shopping? 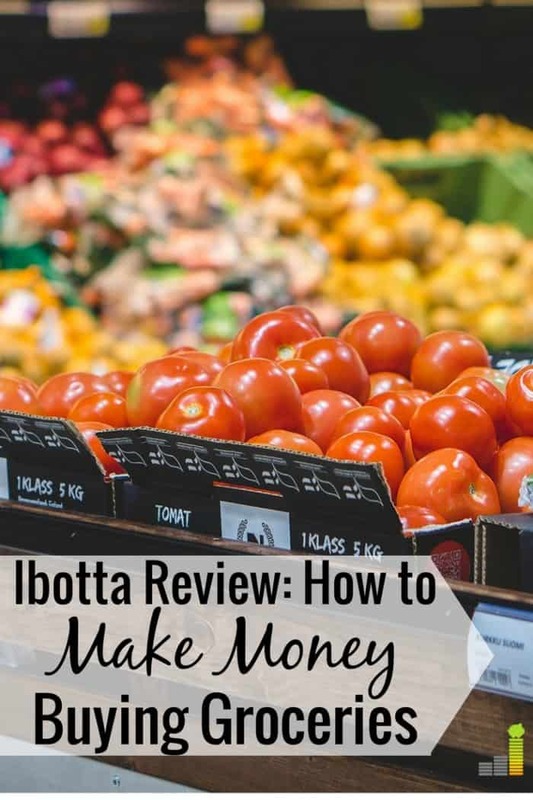 The post Ibotta Review: How to Make Money Buying Groceries appeared first on Frugal Rules.